Sometimes the best surprise comes when one is least expecting it, and this bizarre melange of coming-of-age drama and Fargo-esque black comedy/thriller is a great example. Who would have thought a film with such disparate genre elements could work, and yet somehow, director Morten Tyldum (just) manages to pull it off. 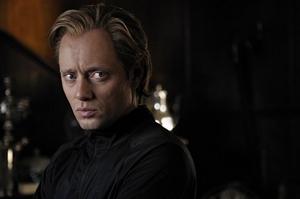 Aksel Hennie is Roger Brown, a 1.68m tall headhunter for an employment firm, tasked with finding the future head of GPS technology company Pathfinder. He sidelines in art theft, the only way he can maintain the lavish house and lifestyle he sees as necessary to keep his much taller, strikingly beautiful wife Diana (Synnøve Macody Lund). When she introduces him to Clas Greve (Nikolaj Coster-Waldau) it seems Roger has found the perfect mark – for both of his professions. Headhunters is a very ambitious film that expects its audience to stick with it through a wild ride through film genres, starting with light-hearted comedy, progressing through heist film, black comedy, thriller, back to heist film before finishing back at quiet comedy. It is brave, and perhaps a little foolhardy, but whether through happy chance or the skill of the writers and director, it manages to keep its audience’s interest and never descend into unintended farce. For some, there might be too many competing elements on show, but I found the ride utterly thrilling. It is the performance of Hennie as the protagonist that anchors the film, and without his ability to be equal parts winner and loser the film had no chance of success. The few days in his life that are depicted are tumultuous and horrific and, although he starts out as a charming character with a major character flaw, Roger’s small-man syndrome will lead him to take a risk that might destroy his life. Hennie performs brilliantly in a film that features him in almost every scene. He is supported well with Coster-Waldau making a strong impression as the mysterious mark, and Macody Lund does a great job of the ever-patient Diana. Eivind Sander and Julie Ølgaard have fun with small supporting roles. The writing allows for several characters to make their mark, particularly Joachim Rafaelsen as Brugd. The script is clever, and Tyldum’s direction brisk. This is the kind of film in which everything has its purpose, and the brilliance with which Tyldum and his lead character Roger bring the many disparate pieces together into a coherent ending is something to behold. This is a high quality production, and although it features some entirely unforeseen gore at moments, is wonderfully entertaining throughout. There will be those for whom the genre excursions will rankle, but hopefully there will be at least as many who enjoy the thrill of the ride. The film has already been picked up for a Hollywood remake, but – a bit like with the American remake of The Girl with the Dragon Tattoo, which was also a screen version of a popular novel – it is hard to imagine it could surpass the fun of this first adaptation. This entry was posted in Film Reviews and tagged Comedy, Heist, Thriller by Mark Lavercombe. Bookmark the permalink.